THE Creative social retreat is a gathering space for anyone who is seeking a nourishing environment to make artwork and expand their creative skill set. Next Spring, we hope you can join us for our second Creative Social Retreat! We will gather to nurture our creative sides and our desire to connect with fellow humans. There will be five different artist-led workshops, meaningful conversations, and a chance to make new friends. Dani Ives is a self-taught fiber artist and founder of Good Natured Art. Her inspiration comes from a love of nature and science, which has an enormous influence on her work. Her enthusiasm for animals from an early age took her on a university and career path based in biology and conservation education, after which Dani worked as an educator at a zoo for ten years. During her conservation education career, she sought out hobbies to fulfill a need for artistic endeavors and stumbled upon needle felting. Over the course of a few years, Dani developed her distinct style of needle felting that she calls "painting with wool." With this style, instead of using paint and a brush, she uses wool fibers and a felting needle to create the effects of layering color, creating texture and depth. She strives to push the boundaries of this fiber art by creating animal portraits and botanical pieces that are packed with details and realism. Dani has taught hundreds of students in workshops across the United States and internationally, including a six-week course at Crystal Bridges Museum of American Art. She really enjoys teaching others how to create their own needle felted "paintings" and loves to see her students discover the endless possibilities of working in fiber arts. Dani is currently writing her first book, coming to a bookstore near you in Spring 2019. She lives in Rogers, AR with her husband and two pups. Stacie Bloomfield is the illustrator behind Gingiber: a stationery and home decor brand that adds "Zest To Your Nest". Inspired by the playful nature of animals, Gingiber creates animal-centric art prints, stationery, pillows and homewares so you can fill your home with pretty things to look at and use. Once upon a time, Stacie couldn't find artwork for her daughter's nursery and decided to take matters into her own hands. She kept being drawn (get it?) to the irresistable essence of animals: their furry faces, their perky ears, their plethora of colors and textures. Animals simply have a way of being adventurous and fun: visually, figuratively and literally. At Gingiber, we believe life should be that way, too. Gingiber has been featured on Martha Stewart.com, Better Homes and Gardens Magazine, Country Living Magazine, At Home Arkansas, DIY Magazine, Where Women Create Magazine, to name a few. In addtion to selling her products to 350+ retailers across the country, Stacie has licensed her artwork with companies such as The Land of Nod, Moda Fabric, PaigeTate Coloring Books, Chasing Paper Wallpaper, West Elm, and Crane and Co. Stacie lives in Springdale Arkansas with her husband, Nathan, and 3 children: Violet (9) Lucy (6) and Dexter (3). Amber Perrodin is a mixed media artist, printmaker, and event producer living in downtown Springdale, Arkansas. She has a Bachelor of Fine Arts degree in Printmaking from the University of Arkansas and is represented by several galleries from across the US. Her pieces often express a love and appreciation for the quiet, poetic nature of combining muted colors, papers, discarded prints, metallic gold, and paint on birch panels. Aside from leading private workshops and classes from her studio, Amber has also taught printmaking and mixed media workshops at Crystal Bridges Museum of American Art. 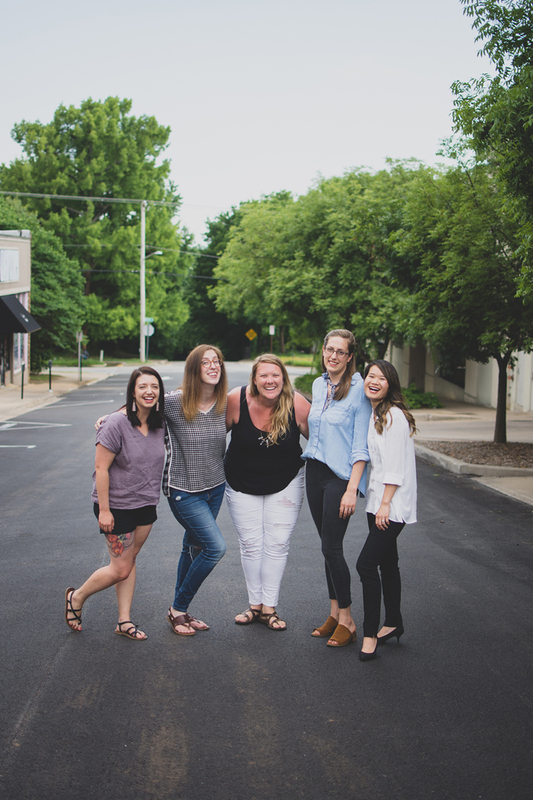 Amber is also the founder and Creative Director of Northwest Arkansas’ premiere indie craft show, The Little Craft Show, producing nearly a dozen events a year across four different cities in Arkansas. Amber is happily married to her favorite man crush and artist, Jonathan, and has two wildly creative daughters, Raine (15) and Ezmah (9). Tram is the artist and designer behind Tram Colwin Art, where she creates custom artwork, prints, and stationery goods. She was born in Vietnam, and lived there until her family immigrated to America in 1996, following other relatives straight to Bentonville, Arkansas. Growing up, Tram always had a love for art and took every art class that was available in school. This led to her earning a degree in Fine Arts. After completing college, work took her to Hawaii, where she met her husband, Charlie. After getting married in 2014, they moved to Florida for an internship for Charlie in sustainable agriculture. During this time, Tram worked as an art instructor and on private commissions. After their time in Florida, Tram and her husband moved back to the NW Arkansas area that they love. It was after this move in 2016 that Tram began pursuing her art career more fully. Her work has been featured on WeddingChicks.com, and in magazines including FLUX Hawaii and At Home Arkansas. What started out as a side job has blossomed into a growing, full-time business. When she’s not in her studio, Tram enjoys spending time with her husband, her family and her pup, Finn, and exploring the Ozark trails. Leana is a designer and artist with a stationery and gift brand called May We Fly. Both of her parents are artists, so growing up, her creativity was very encouraged. Though she didn't take many art classes growing up, she always loved to draw, and took drafting class in high school. This led her into the field of architecture, which she studied at Virginia Tech and did professionally for a number of years. Though she enjoyed designing buildings, she never felt quite herself in an office setting and found much of the work to be creatively frustrating. In 2013, she married her husband Dan and moved to Fayetteville so that he could pursue his PhD in History. This left Leana temporarily without work, so she used the extra time to get back into her painting and drawing, which she hadn't done much of since college. She fell in love with it all over again and started to take it more seriously. After about a year, she opened her little shop, May We Fly, as a place to sell the pieces she was creating. Slowly but surely, it grew into a full-fledged business. Today, Leana has a studio shop in Fayetteville, Arkansas, where she creates artwork for her stationery products and paints custom pieces for clients including Hallmark and Papyrus. In addition to her artwork, Leana has taught hundreds of students how to begin using watercolor through workshops and multi-week courses. We will be spending the weekend at a beautiful home in Breckenridge, Colorado. This space is where we will share meals, sit by the fire, and hold each workshop. You can learn more about the home here. Over the course of the weekend, each of our five instructors will be leading a two-three hour workshop on a range of subjects. Click on the button below to take a look at our full schedule for the weekend. We couldn't be more excited to meet you, make artwork with you, and enjoy a weekend of fun and creativity! Have any questions that our FAQ page couldn't answer? We're here to help! Fill out the form below and we'll be in touch soon. Jalapeño and Pineapple. Or Mushrooms. Plus I add arugula to everything. What vacation destination are you dreaming of? La Croix, yes or no? Hiking through the woods is very healing and helps me re-center. Toss up between Strawberry and Cinnamon. I have too many… but I’ll keep it to two, "I Love Lucy” and “Saved By the Bell"
Taking care of my house plants or taking a walk in my local botanical garden or nursery when I can’t hit the trails. Toasted coconut, but I recently discovered Pedal Pops all natural fruit popsicles and I’m now obsessed! My podcast repertoire is slightly lacking, but I’ve occasionally enjoyed "Positively Creative "and "Creative Pep Talk"
Oh, self care is one of my favorite things! Meditation, exercising daily, digging in my garden, reading, treating myself to an occasional massage, taking a local class or workshop, and spending time with good company. recently tried a handcrafted tequila ice cream from Michoacana, Mexico and I'm still thinking about it. I wanted to be all of the usual things; teacher, vet, marine biologists...you, know. I really love "The Positive Head Podcast", "Super Soul Conversations with Oprah" (sounds corny, but they always dig deep and it's SO good), "Hurry Slowly", and an oldy but goody, "The Robcast"! Pepperoni, but I love all pizza. I practice yoga and pilates almost daily, walk often, and love spending time in the pottery studio. Mint Chocolate Chip and Peanut Butter Cup are my go-tos. A Meteorologist. This was a temporary phase, but a real one. Stay in the know about key dates and important information.